Anyone who knows me knows I have a big heart. I enjoy serving the Lord and seek to do whatever I can to help and encourage those around me. That’s a good thing, but sometimes, it feels like a burden because I am just one person and I can’t do everything I want to do. I want to be available to feed the homeless or sit with the shut-in. I long to visit the nursing homes and the sick in the hospital. I’d love to foster a child who needs love or be a listening ear for the young woman who’s at the end of her rope. And what about writing cards of encouragement to the ladies in our church or to those I’ve never met but who have found a place in my heart. I want to do it all. I feel the pull to do more, serve more, help more, encourage more. But here’s the thing, I’m not Wonder Woman. Far from it! Between trying to run a home, running a writing/speaking ministry, and being on deputation to raise the funds to get to the mission field, I have no time and energy left to contribute toward all these other legitimate needs. At times, I feel guilty—lazy even. After all, other people have full plates and still manage to find time to help out more. Maybe if I slept a little less or cut corners somewhere, I could make it work, but not only is that unrealistic, it’s dangerous. I’ve written and spoken to audiences about stepping up and doing something for the Lord. I’ve reminded those who are quick to say, “Somebody should help out in that ministry” that they are somebody, and maybe they’re the ones that need to get involved. And I believe that. But I’ve also come to realize that no “somebody” can do everything, and God never intended for them to. God doesn’t want a select number of Christians to do more and work harder but rather He wants to see all of His children get involved in His work. Why should one person feel the need to participate in four or five different ministries while others are doing nothing? I’m not writing this today to put a guilt trip on anyone though I will say we should all be pulling our weight for the kingdom of God. My real challenge today is to those like me who have big hearts, great desires, but little time and energy to see those things done. God doesn’t want us stressed out and hanging on by a thread. He wants us to be serving joyfully, and that’s not possible if we’re being pulled in a zillion different directions. Remember, He is not the author of confusion. 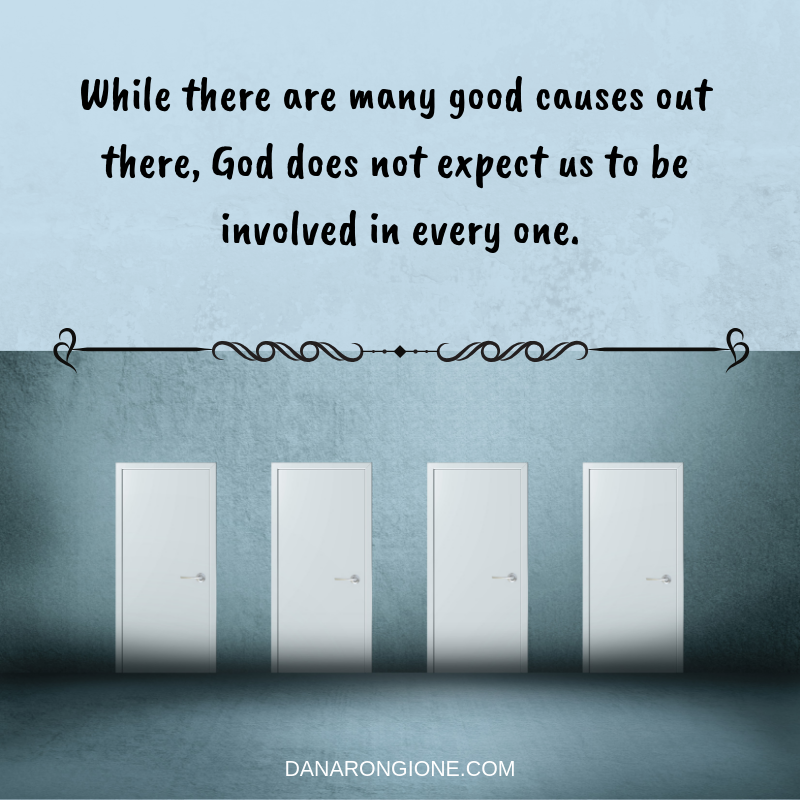 While there are many good causes out there, God does not expect us to be involved in every one. Instead, He wants us to focus our time and energy on the specific path He has set for us. For a while, my path was ministering to the ladies at my church through Sunday School. Before that, it was educating young children. Now, it’s raising support to get to the mission field of Wales and doing my best to encourage those I meet along the way. Life is full of seasons. Maybe one day I’ll have the opportunity to help out in other ministries, but for now, I must concentrate on the task before me and not get distracted by my Wonder Woman dreams. Yes, I am somebody, and I have a job to do. But I cannot do everything. . .and neither can you. Don’t stretch yourself so thin you’re not of any use to anyone. Follow God’s specific path for you and pray He will send laborers into the fields of area you cannot currently serve. Then let it go. Don’t allow yourself to be overcome by guilt or shame. Just do the work God has set before you. That’s all He’s asking for. Is Your Service Impeding Your Stillness? I apologize it’s been a few days since I’ve been able to post a devotion. At the end of each month, there are a lot of little tasks I have to see to, and on top of that, Jason and I spent the past three days in meetings for our college alumni days. It was a good week, but it was busy, and I’m worn out. But, I’m back and wanted to share with you something I learned during the week. One of the preachers in the evening meetings preached a message on the prodigal son and brought out something I had never really thought about. The idea has stuck with me, so I wanted to share it with you. To save time, and for those of you who may not be familiar with the story, let me summarize it. A man had two sons, and the youngest son decided he was ready to be out on his own. He demanded his inheritance and headed into a far country where he wasted his money on worldly living. With his money and “friends” gone, he found a job keeping pigs. On the job one day, he realized that even his father’s servants had a better life than he did, so he decided to make his way home and beg his father to allow him to be one of his servants. When the father saw his son coming, he ran, hugged him, and called out to his servants for them to bring the best robe, ring, and sandals to place on the long, lost son. After that, the father prepared a banquet to celebrate the return of his youngest. I have no idea how long it takes to gather up a calf, kill it, cook it, and invited enough people for a party, but I would assume it would take at least a couple of hours, right? After all, these people didn’t have convection ovens or microwaves. It took time to prepare for this celebration. But notice, the elder son didn’t have a clue what was going on. He had been out working in the field, and when he neared the house, he heard the music and dancing and asked one of the servants what was going on. He was completely in the dark. He had no idea his lost brother had come home. He didn’t have any inkling there was a party taking place. How is it that everyone else knew to go to the party except him? I think it’s safe to say he was so busy working for his father that he forgot to keep in touch with his father. He knew what work had to be done, so he went off and did it, but in doing so, he didn’t stay in communication with his father. He was doing a good thing in that he was serving, but as we’ll see later in the story, he had a bad attitude and poor motives. Unfortunately, I can relate. I know what’s it’s like to be so busy serving God that I forsake Him. I don’t spend time with Him like I should because I need to be busy working for Him. I know what work needs to be done, so I march off on a mission and leave my Father behind. Yes, I can sometimes go through the day so intent on my work for God that I forget to communicate with Him, and in doing so, I miss out on the celebration. The delight of serving soon becomes a duty. My attitude sours. My motives become skewed, just like Martha who was careful and troubled about many things. She, too, had a heart for service, but that service soon impeded her stillness. While Mary was enjoying the celebration of basking in Jesus’ presence, Martha was grumbling, weary in well doing. Oh, dear friends, life is a balancing act, and serving Christ is no different. God doesn’t want us to sit on the sidelines and do nothing, but neither does He want us to become so distracted by our service that we lose sight of our Savior.